1. Santa will telephone you just before his arrival. If the contact number you’ve given Santa is for a cell phone, make sure that phone is on and being monitored. 2. If possible, have an adult meet Santa outside before he gets to your door. If you’ve made arrangements for Santa to deliver gifts, those can be transferred to Santa’s bag before he rings the doorbell. If the gifts will fit in a large trash bag, they’ll fit in Santa’s bag. Make sure name tags are securely attached (or write the names directly on the wrapping paper). 3. If parking is limited, please reserve a parking spot for Santa as close as possible. A sign saying, "Santa Parking Only" or "Reserved for Santa" adds to the fun. If that spot is not readily apparent, the adult who meets Santa outside can provide direction. 4. Use the time after Santa telephones to gather the kids or guests together so they won’t miss Santa’s entrance. Depending on their age, it often works well to have one or more of the children actually answer the door. Have your cameras ready! 5. 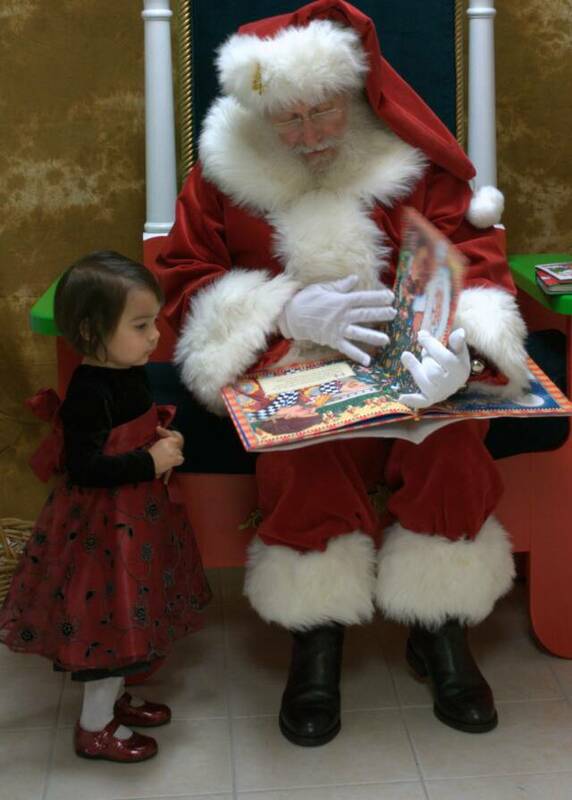 Decide ahead of time where Santa will sit for photos. A straight backed chair (without arms) placed in front of the Christmas tree or other festive background usually works well. Leave some room behind the chair so that several people may get into the photo together. Give some thought to the pictures you’d like to take. Don’t forget the older children, aunts/uncles, grandparents, etc. No one, including Grandma, is ever too old to sit on Santa’s knee, and these make adorable pictures! 6. If you have very little children who seem reluctant to approach Santa, don’t force the issue. Let them watch from a safe distance and give Santa a chance to work his magic. 7. If Santa is owed payment, please place that in a Christmas card envelope and hand it to Santa as he’s preparing to leave. Handing Santa a Christmas card looks quite normal to children; handing him money does not. 8. Expect Santa to contact you again within a few days of his visit to ask for your feedback. He looks forward to that input and if you have specific suggestions for “next time,” be sure to share those ideas.